The Mk 75 gun (fig. 6-26) is a fully automated, remotely controlled gun mount that stows, aims, and fires 76-mm, 62-caliber ammunition. The system is currently aboard FFG-7 and PHM class ships along with the Mk 92 FCS. The design of the gun mount makes extensive use of lightweight corrosion-resistant alloys and modem engineering techniques. The result is a lightweight, compact, fast-firing, versatile weapon. It is primarily a defensive weapon used to destroy antiship cruise missiles. However, it can also be effectively used against surface and shore targets. The gun has a variable rate of fire of up to 80 rounds per minute with a range of up to 16,459 meters and a maximum altitude of 11,519 meters. The most notable innovation featured on this system is the automatic barrel cooling system. This allows sustained operation at high rates of fire without excessive barrel wear or the danger of a "cook off" if a misfire occurs. 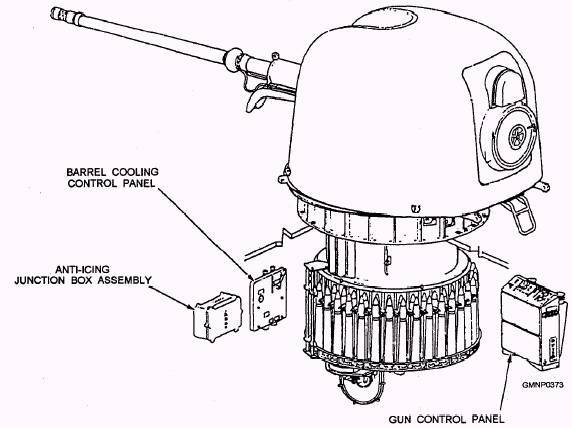 The Mk 75 gun fires a somewhat limited variety of percussion primed ammunition types. The types of ammunition currently available include point detonating (PD), infrared (IR), radio frequency (RF), and blind-loaded and plugged (BL&P). The gun mount crew consists of the mount captain, two loaders, and the safety observer. The mount captain is stationed in the ammunition-handling room at the gun control panel (GCP). It is his or her responsibility to set the gun up for the desired mode of operation, then monitor it in case of a malfunction. In case of a malfunction or misfire, the mount captain supervises and directs the corrective action. The two loaders are stationed in the ammunition-handling room during loading and unloading operations. Their primary duties are to load and unload the gun, clear misfires, and assist in corrective maintenance. 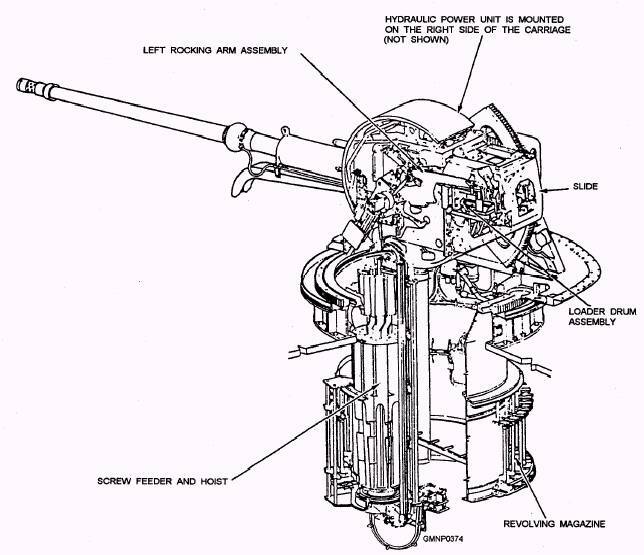 Figure 6-26-The Mk 75 gun system, general configuration. The safety observer is stationed topside near the gun. His or her responsibility is to monitor the gun and the area around the gun for any unsafe condition. The safety observer is in direct contact with the mount captain. We will now describe the loading system as we walk through a loading sequence. The ammunition-handling system (fig. 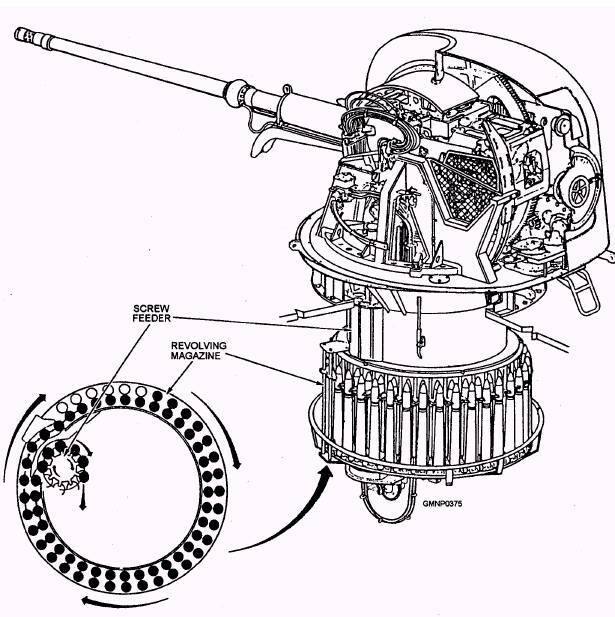 6-27) for the Mk 75 gun mount moves ammunition from the revolving magazine to the last station loader drum, where the ammunition is subsequently deposited into the transfer tray, rammed, and fired. The handling system holds a maximum of 80 rounds. When a round is fired, each of the other rounds advances one position. The handling system consists of the revolving magazine, the screw feeder and hoist system, the right and left rocking arm assemblies, and the hydraulic power unit. The entire loading system moves with the gun in train. The loader drum, which is a slide-mounted component, moves with the gun in elevation. The hydraulic power unit, mounted to the carriage, provides hydraulic pressure to operate the loading system. Ammunition is manually loaded into the revolving magazine. 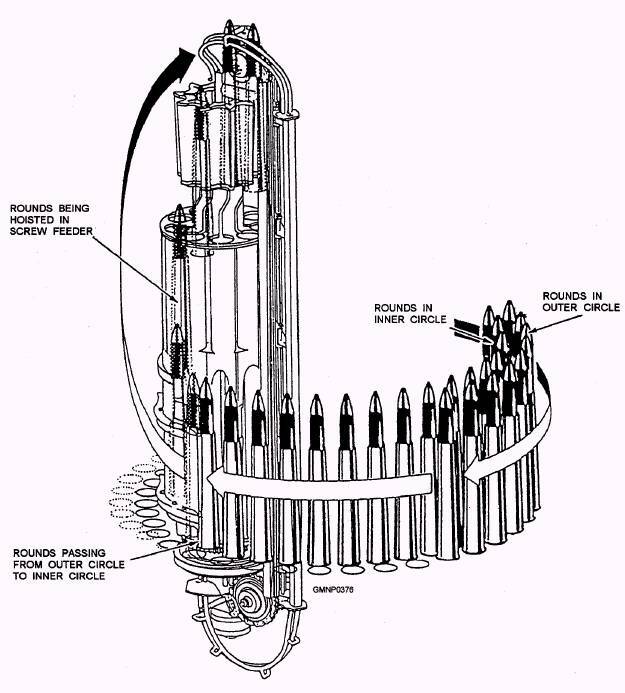 The revolving magazine consists of two concentric circles of stowage cells, each holding 35 rounds of ammunition. The revolving magazine turns when the hydraulic motor rotates the screw feeder. 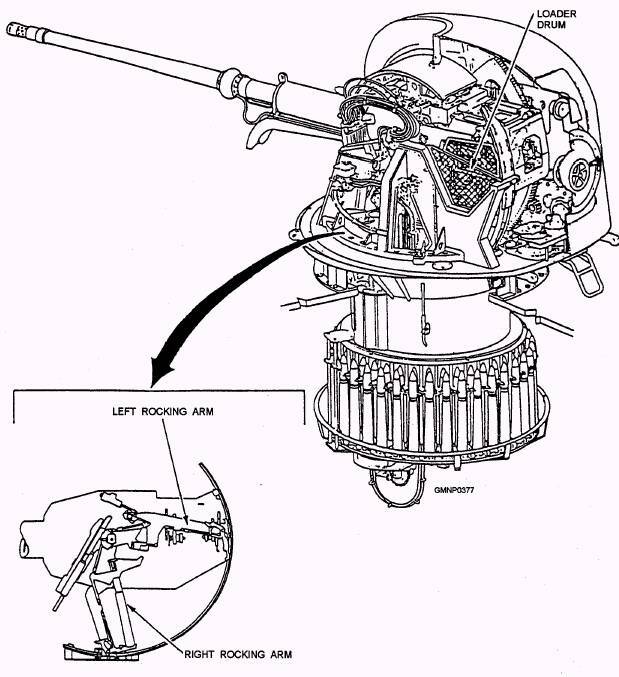 Figure 6-27.-The Mk 75 gun-loading system, major components. During rotation of the revolving magazine and screw feeder (fig. 6-28), around moves from the inner circle of stowage cells to the screw feeder. When a round leaves the inner circle of cells, a round from the outer circle replaces it, leaving an empty cell in the outer circle. Figure 6-28.-Movement of rounds in the revolving magazine and screw feeder. Figure 6-29.-Ammunition flow from the revolving magazine through the screw feeder. raise rounds to the loader drum (fig. 6-30). While one rocking arm is lifting a round to the loader drum, the other arm is returning empty to pick up the next round from the screw feeder. The loader drum has a capacity of four rounds. As the loader drum receives around from the rocking arm, it rotates to deposit the round in the last station of the loader drum and then into the transfer tray for subsequent ramming and firing (fig. 6-31). The Mk 75 gun system uses a percussion firing system. During recoil, the breechblock is lowered and the empty case is extracted into the empty case tray from which it is ejected out of the system. This completes the loading cycle for one round. Figure 6-30.-Movement of rounds from the screw feeder to the loader drum. 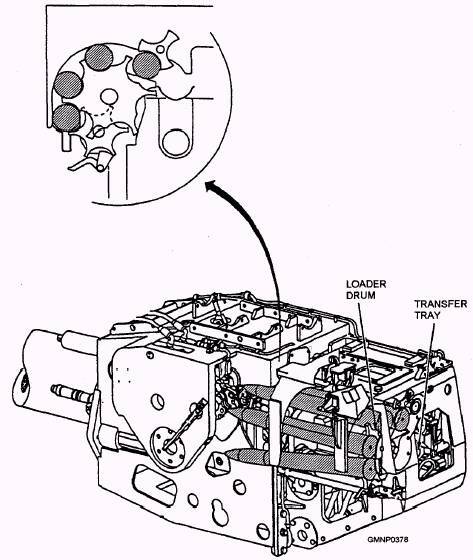 Figure 6-31.-Movement of rounds in the loader drum.